Those were different Keychains to their original keyblades. Just like Sora's Kingdom Key changes based on whatever Keychain he currently has attached to it. Data!Sora had an evolved version of KK in Re:Coded if I remember right. They might change to some extent considering that almost every person's individual Keyblade is custom made for them and meant to play to their strengths. Like, even when they use the same Keychains, Terra always has the biggest and bulkiest versions because he's the bruiser, Aqua gets the medium length thinner versions because she's the mage and is of average stature, and Ven gets the shortest ones because he's the speedster and the smallest. Most people have their Keyblade's for life so in some cases I think it would be natural for Keyblades to change with their wielders, especially if their old design no longer functions as well. TAV's Keyblade's change through obtaining Keychains though so in that case I don't think the Keyblades are "evolving". I think they're more symbolic of the growth the characters went through more than anything. It's hard to say with the Zero/One. I used to have a theory that when Data Sora got his Keyblade back in Hollow Bastion, that it was a real Keyblade from the real (not Data) world, and that the Zero/One was its natural form. But Nomura has since said some things that disprove my theory. Maybe the Zero/One is the "new form" of his Keyblade... but my theory is definitely punctured. I wouldn't say they evolve but rather reflect their wielder. Terra and Aqua's upgraded keychains are just that, keychains. If you watch scenes in the theater mode it always shows a persons default keyblade. Even when Aqua was wandering the dark realm and Terra & Ven's keyblade came to save her Terra's was it's base form. What's interesting to note about Terra and Aqua's keyblades is that their forms remain the same in the theater mode until the moment they both abandon them. When Aqua sacrifices her armor and keyblade to save Terranort it changes shape by the time he's found. Terra's keyblade changes shape when the Lingering Will Forms. But by the time either of these happen they done had the keychains to access those forms so meh. It might be best to just not rule it out. We know so little it's honestly impossible to say what a keyblade can or can not do. Though I imagine if a keyblade did evolve it'd be an important occurrence and that it'd stay in that shape in all it's later appearances. I started a thread similar to this a while ago, and while the general consensus was basically the same, I thought I'd add my ideas from that post. It also had pictures. Kinda long, but stay with me. I have photographic evidence. Throughout the series we've seen characters do some impressive things with their keyblades, but something I found interesting was the idea of a character's keyblade evolving- not transforming or switching keychains, but evolving. The difference being transformations are temporary changes in the shape and proportion of a key while maintaining the same basic parts. When switching keychains, the two keys generally have nothing in common stylistically as most keyblades are unrelated. This has happened with at least two characters, Terra and Aqua, and possibly also Riku and Xehanort. For Terra and Aqua, both are shown with Earthshaker and Rainfall respectively in official promotional works and have these as their default keyblades, but somewhere between the Mark of Mastery Exams and the final meeting at the Keyblade Graveyard they canonically begin wielding Gaia Bane and Rainstorm, which are also shown in promotional works and appear in future installments with the Lingering Sentiment and Aqua's armor when she saves Terranort from the realm of darkness. Both keys are clear upgrades of the previous pair while retaining similar designs and names (Gaia Bane is also known as Ends of the Earth). No one give yo these keys, they just show up. Something happened to make these keyblades progress to a higher or more complete form. The evolution of Riku's weapon is a little less cut and dry due to Soul Eater's status as a regular sword. 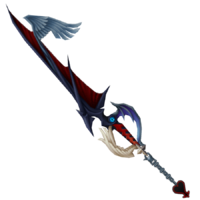 War to Dawn is Riku's keyblade that comes to him in KH2, replacing Soul Eater as his primary weapon. While it's generally accepted that WtD uses Soul Eater to manifest, it can be debated as to weather WtD is an evolution of Soul Eater directly, or just a keyblade with a striking resemblance. Sure WtD has some things Soul Eater doesn't, but the likeness is just too strong to be a coincidence. Plus, thematically the changes can be said to reflect the growth of Riku's heart from being surrounded in the darkness (a single demon wing) to becoming stronger and walking a path of both light and darkness (four wings total, two angel and two demon). Once again, the upgrade is not shown to be a keychain given to Riku by anyone. The evolution of Xehanort's keyblade the hardest to prove of the bunch, mostly because we know so little about him and his life prior to being an old man bent on apocalyptic world war. If you look at the two keyblades we see Xehanort using, one as a young man, and the other as the old master, there is somewhat little in common. The both have the metallic demon wings, horned head, and the demon eye, but in different places and sizes. In fact, the two keyblades have completely different color schemes and themes, YX's themed after time while MX's seems to be just about darkness. The pattern only really comes to light when you include the keyblade, No Name, which is an obtainable keychain for defeating the BbS secret boss, the Unknown. With No Name at the front, we see a three stage keyblade evolutionary line, with YX's keyblade's odd design a now obvious midpoint. My question to all of you is, what do you think facilitates this change? Is it caused by great personal growth or change of heart? And why don't other keyblade wielder's experience this? Did Ventus not experience the same growth ans Terra and Aqua? Has Sora not learned enough or changed because of his travels? What do you think of this theory as a whole?